FASHIONCLASH and Kevin Murphy have something to celebrate at the 10th edition of FASHIONCLASH Festival; a 5-year long partnership. A team of crazy talented hairdressers will be showing their skills backstage to create the most magical hair-do’s. Besides this, FASHIONCLASH and Kevin Murphy are creating a series of videos, photos and give-aways in relation to this year’s festival theme; ‘Fashion My Religion!’. Kevin Murphy has just graduated school when he is asked by Vogue to shoot an editorial. This opportunity kick-started his career. Besides owning his salon, he is working to become one of world’s well-known session stylists. The products he uses for his assignments don’t seem to do the job and cause skin irritations. Kevin Murphy starts experimenting with oils and plant-extracts and his first product is born. In 2004 Kevin launches his first line of products under his brand name KEVIN.MURPHY. KEVIN.MURPHY stands for eco-friendly and cruelty free performance based products developed with ingredients from nature and the most recent skincare technology. The result: weightless hair products that perform a long time, give strength and above all are paraben- and sulphate-free. All the KEVIN.MUPRHY hair products are not only good for your hair, but also for the environment. And are you just someone who goes for appearance, then KEVIN.MURPHY is also your go-to brand, because the pastel packaging is so cute, we bet you’ll never want to buy anything else again. What is your hair secret? Do you have something to confess about your luscious locks? And what is your sacred hair tip? These are some of the questions that will be answered by guests of the FASHIONCLASH Festival. You can share your story with the hashtag #HairMyReligion. FASHIONCLASH is honoured to team up for the fourth time with KEVIN.MURPHY during the 9th edition of FASHIONCLASH Festival. With the support of their talented hair team they will again create the most amazing runway looks! During FASHIONCLASH Festival almost 20 hair designers will be styling over more than 100 models. Each year, KEVIN.MURPHY invites all of their SESSION.SALONS to audition for the chance to work directly with their team backstage at the event. Between ten and twenty talented artists are given the amazing opportunity to assist hands-on during the show, providing them with a first hand “behind-the-scenes” experience! The festival’s overall theme of “Fashion Makes Sense” will set the stage for the underlying inspiration behind the looks KEVIN.MURPHY will be creating at this year’s show. ABOUT: KEVIN.MURPHY With a long career spanning fashion, runway, editorial and film, Kevin Murphy is one of the worlds most respected and sought after Hairstylists. Recognised internationally for his long list of celebrity clientele including Cate Blanchett, Naomi Watts, Kylie Minogue, Enrique Iglesias, Heidi Klum and Jessica Hart and Abby Lee AND countless pages of editorial work for high-end magazines around the globe, such as Vogue, Harper’s Bazaar, Marie Claire and Vanity Fair. 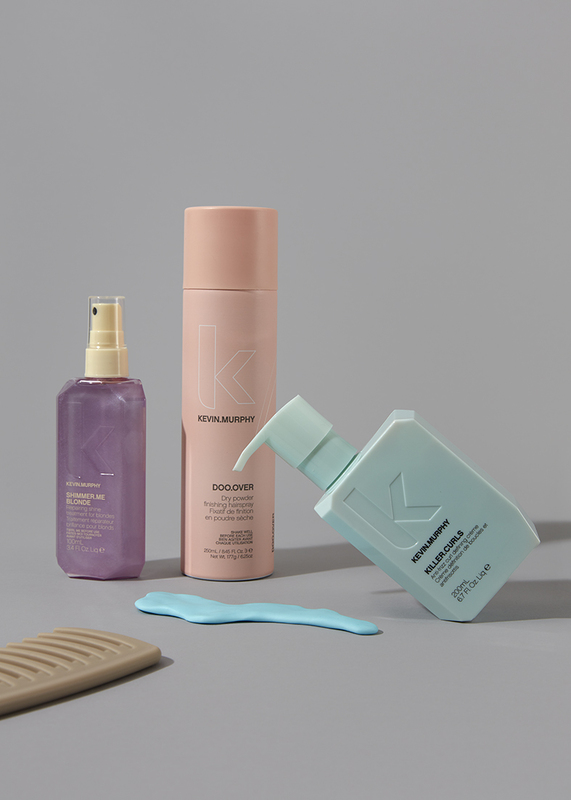 KEVIN.MURPHY is a fashion focused range of salon only, professional, hair care products created by Kevin to meet his needs as an editorial hairstylist. Unsatisfied with the performance of mainstream hair products, Kevin recognized the need for weightless products that provided performance, strength and longevity to support today's ever changing looks. Born from the same philosophy as skin care and inspired by nature's best, the KEVIN.MURPHY range of shampoos, conditioners, treatments and styling aids, is an indulgence of runway looks and natural aromatherapy catered for every hair type. THE CHOICES WE MAKE KEVIN.MURPHY truly underlines and empowers this year’s theme “Fashion Makes Sense”. KEVIN.MURPHY cares about the environment and recognize the seriousness of dangerous climate change. KEVIN.MURPHY not only produces products with best natural ingredients. Their products are also eco friendly. All packages are 100% recyclable. When searching the world for their ingredients, KEVIN.MURPHY looks for companies that use small scale cultivation, organic growing practices, or ecologically sound wild harvesting techniques to minimize the impact on the environment. AND, as a cruelty free company, KEVIN.MURPHY tests on models. Not on animals. #HOWABOUTTHATHAIR? Well, how about it? Need some inspiration for FASHIONCLASH Festival or want to create your own runway-ready look? As of now, every Wednesday FASHIONCLASH & KEVIN.MURPHY are already teaming up to deliver some beau-ti-ful hair inspiration! Check out Instagram and make sense of your hair! We will also be sharing some “behind-the-scenes” sneak peeks and “must-hair-haves”!